Well, it’s hard to believe but our trip has finally come to an end. Now it’s time to take a look back and reflect on the last 7 weeks. Coley: Emirates. Great food and fabulous flight attendant outfits. Kim: I really enjoyed flying on Thai Airways, but Emirates definitely had the best food. Air New Zealand and Quantas were nice too….I can’t decide. Favorite hostel or place you stayed? Coley: This is the hardest question! Favorite hostel/guesthouse: Charlies—a charming little guesthouse in Chiang Khong, Thailand with a pool, bikes for cruising around town, and homemade pancakes in the morning! Favorite hotel: Aiyara Palace. Its modern design and amenities made for a luxurious night’s stay right in the heart of Pattaya. Favorite home stays: Tan’s family in Thailand and the Hutchinson residence in Australia. Both families spoiled us beyond belief and showed us around their amazing cities. Kim: Accents on the Park hostel in Nelson, New Zealand felt more like a home than a hostel. It was clean, comfortable, and the owner Royce was one of the nicest people I’ve ever met. They even had heated floors in the bathroom!? Talk about luxury hostel. Coley: Thailand. I really just loved everything we experienced here from elephant rides to the floating market. It is just an incredible country filled with the nicest people imaginable. Kim: I think it’s difficult to pick a favorite country because each one is so different that they’re too hard to compare. So instead, I’ll tell you my favorite place in each country: Wellington, New Zealand, Melbourne, Australia, Chiang Mai, Thailand, and Luang Prabang, Laos. Kim: Ziplining in Chiang Mai definitely wins, but zorbing in Rotorua, New Zealand would come in second place. Coley: I had some rocking crab curry at a beachside restaurant in Pattaya, Thailand. Kim: I had the most amazing chicken parcels meal in Ashburton, New Zealand. I’d also like to give honorable mentions to Fergburger in Queenstown, New Zealand, the banana chocolate roti from a random street vendor in Chiang Mai, Thailand, Pancake Manor in Brisbane, Australia, and the homemade stir fry our friend Allan made us in a hostel one night. Least favorite food you tried? Coley: These crazy little pork balls with beans in the middle that we had at a restaurant near Kanchanaburi, Thailand. Kim: Squid is absolutely disgusting. Coley: Most definitely Thai iced tea. Seriously, that sweet little concoction is addicting. Kim: Thai iced tea is the bomb. Coley: Gelato from Kaffe Eis in Wellington, New Zealand. My personal favorite was coconut in a cone. My mouth is watering just thinking about it. Kim: It’s a tie between the cookies from Cookie Time in Queenstown, New Zealand and the Chai gelato from Kaffe Eis in Wellington, New Zealand. Coley: Scarves from markets in Thailand and Laos. My family and friends loved them…wish I had bought more! Kim: I bought a prosperity cat on the street in Bangkok, Thailand and within a week of having it I won $50. Hopefully it keeps working! Favorite quality about your travel partner? Coley: Her ambitious nature—if there’s a way for us to see the best parts of a city in only one night, she will find way to do it. Kim: I love that Coley just totally goes with the flow in any situation. She also doesn’t get easily annoyed or frustrated like I sometimes can. What will you miss most about traveling? Coley: No responsibilities except waking up to catch your bus! Kim: I honestly just love living the backpacker lifestyle. Backpacking is really a culture of its own and you get to meet so many interesting and like-minded people. I’m also going to miss never knowing what day of the week or what time it was, and it not really mattering. What skills did you acquire on the road? Coley: Making PBJs with inadequate utensils, being super quiet getting ready in the morning as not to wake hostel roommates, and just going with the flow. Kim: Distinguishing where people are from based on their accent, grocery shopping in Australia and New Zealand without spending more than $3 on any single item, using chopsticks, mixing and matching outfits to make it appear like I owned more clothes than I actually did, learning how to properly cook rice, and learning how to speak some basic Mandarin Chinese. If you were to go back and plan your trip again knowing what you know now, what would you do differently? Coley: I would want to explore more of Southeast Asia because the culture is fascinating and cost of living is ridiculously cheap. Kim: I would visit less countries and stay for longer amounts of time. Because we tried to fit so much in in 7 weeks, we didn’t have much flexibility in our schedules. There were a few cities that we really loved and wished we could have stayed longer to explore them further. It is also quite exhausting to be traveling for a minimum of 4 hours almost every single day. How many items did you cross off your life list on this trip? Coley: Too many to count. What were some of the best items you packed? Coley: Flashlight, green zip-up hoodie, and mini speakers. Best items I didn’t pack? Warm socks and green oil. Kim: Columbia fleece jacket, padlock, and the UV filter on my camera lens (see Q&A #5). What advice would you give to someone thinking about planning a trip like yours? Coley: Do it! Pick where you want to go and start saving. Kim: If traveling has always been a dream of yours, then it’s up to you to create the opportunity and make it happen. Save your money, buy a plane ticket, and go. No excuses. Sum up 3 things that you learned on the trip? American backpackers are the minority among travelers. We heard from several people that we were some of the first backpackers from the U.S. they’d met so far on their trip. Let’s change that! If you need help with something, just ask. Most people are super willing to help travelers. They’ll recommend great places to eat, give directions, and genuinely hope you have a fantastic time exploring their country. While I loved Australia and New Zealand, you can travel much longer and much more comfortably if you pick a cheaper destination like Southeast Asia. For example, in Laos, we got an hour long full body massage, herbal sauna, bungalow suite accommodation, and three meals (including drinks and desserts), all for less than the price of one nights accommodation in New Zealand. We’re extremely lucky to grow up as native English speakers. I really admired the motivation and determination people have to learn and practice the English language. Now that our time in Southeast Asia has come to an end, it’s time to look back on the spectacular sweets, eats, and food from the street. Papaya salad: A classic Laos dish packed with complex flavors and tons of heat. It is mixed with shredded unripe papaya, lime, chili peppers, garlic, sugar, green tomatoes, and a variety of other ingredients. This dish is prepared with a mortar and pestle and mixed right in front of you. This is so you can give input about how many chili peppers to add, how much sugar, and how you’d like it to taste. Sour, spicy, and perfect for sharing with friends at the local night market. Thai iced tea: Heaven in a glass. This tasty treat is quite different from the American style. It is rich, thick, orange in color, and served with milk poured right on top. We may have ordered one of these bad boys at every coffee shop in Thailand. So when you have the chance to try this super sweet concoction, you may want to make it two. Mango and sticky rice: Rice as dessert? Yeah, that’s what I originally thought, but don’t shoot it down until you try it! 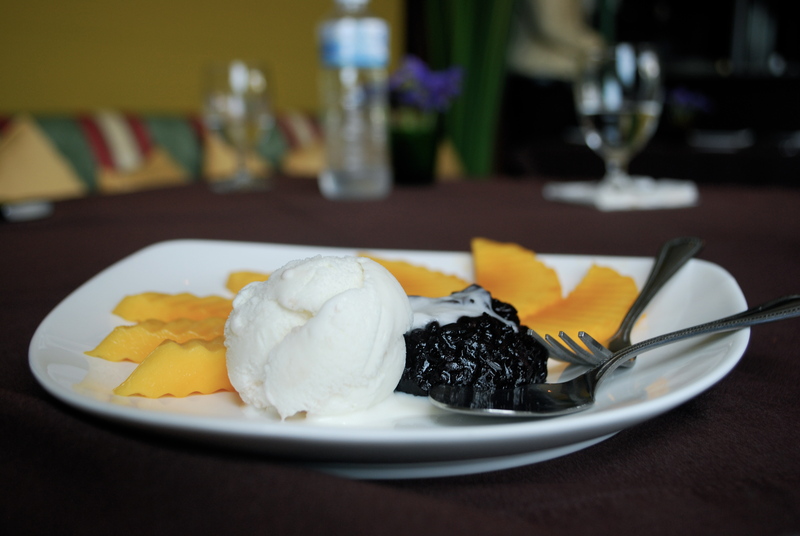 One of the best times we had this dish was with fresh mango fruit, coconut milk ice cream, and black sticky rice. Refreshing, sweet, and rich. Thai fruit: We could probably write an entire post about this category, but we’ll keep it brief. You may see some familiar fruits here such as bananas and mangos, but head to the market and prepare to be blown away by variety. Thai fruit is just as beautiful to look at as it is to eat. Vibrant purple dragonfruit and deep plum mangosteens line the street markets luring in customers with their intoxicatingly sweet scent. A popular fruit you’ll spot at the markets is rambutan. Don’t be fooled when you see it though. It appears to be a sea urchin-like creature but is actually a sweet fruit with a clear center. If you’re not a fan of eating whole fruit, we would recommend it in a fruit shake. Yakult: This intriguing little drink actually hails from Japan. After spotting kids on the street and people on the train sipping this mini drink, I had to find out what it was. It’s actually a nutritious drink filled with tons of bacteria for good digestion. It tastes like melted sherbet and is devilishly cute. Thai seasonings: When you sit down at a restaurant in the US you’ll expect to see salt, pepper, and ketchup at the table. In Thailand, this is not the case. At basically every restaurant and food stand you’ll spot a basket filled with condiments for 4 flavors: sweet, spicy, salty, and sour. As you taste your food it’s common to add whichever flavor you prefer. Well, there you have it. Our favorite bits and bites from Southeast Asia. Can’t wait to go back and try some more! 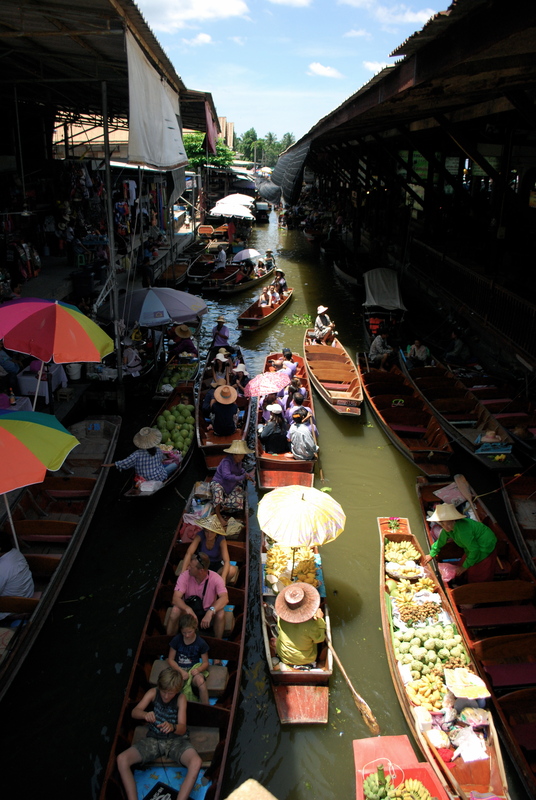 Floating market – This is definitely not your average market. It’s like bumper boats meets the shopping mall. Instead of walking down the street, hop in a rowboat to cruise and peruse the vendors selections of souvenirs, designer purses, spices, toys, and much more. If you’re feeling hungry, you don’t even have to leave the boat. Just pull up to a food vendor (also in a boat) and buy some baby bananas or mango and sticky rice on the spot. You definitely don’t see anything like that back home. Tiger Temple – Located in Kanchanburi, visiting this temple where monks raise tigers can be an easy day trip from Bangkok. Get your growl on at this popular attraction where you can lay next to full-grown tigers and pose for photos with the big guys. Stroll through Tiger Canyon, watch baby cubs being fed, or get locked in a cage while tigers have their daily afternoon exercise. It’s bound to be a grrrreat time. Siam Paragon – This mall is a shopaholic’s heaven. Siam Paragon is the 2nd largest mall in Southeast Asia and contains awide rage of specialty shops and restaurants. If shopping is not really your thing, it also includes a multiplexmovietheatre,aquarium, Thai Art Gallery, opera concert hall, bowling alley, and karaoke center. It’s by far nicer than any mall we’ve ever been to in the US. Alcazar Show – Song, dance, and sequins galore. Belting out hits such as “I Will Survive”, this spectacle showcases beautiful performers in costumes so extravagant Lady Gaga would be jealous. The most shocking part of the show? All of the divalicious dancers are actually dudes. Elephant Show – Watch these extremely intelligent animals perform impressive tasks such as kicking soccer balls into a goal, hula hooping, playing the harmonica, shooting hoops, dancing, and even painting pictures better than we can. We promise you won’t be disappointed. Pak Khlong Talat (Flower Market) – Wander down the aisles of this unique market and you’ll find nothing but flowers of all types for as far as the eye can see. If you’re looking to impress a lucky girl then why not buy her two-dozen roses for the price of about $2. It’s a win/win situation. Khao San Road – Undeniably the most well known street in Bangkok, this place is backpacker central. Khao San Road is always tightly packed with street vendors, shops, bars, clubs, and of course, tons of people. This is also the perfect site to purchase buckets of drinks, bootleg DVDS, fake IDs, or even that Harvard degree you’ve always wanted. Pattaya Beach – If you don’t have time to head down south to the beautiful Thai islands, then Pattaya beach is the perfect alternative. Only a two-hour drive from Bangkok, you can swim in the ocean or just relax on the beach for a wonderful weekend getaway. 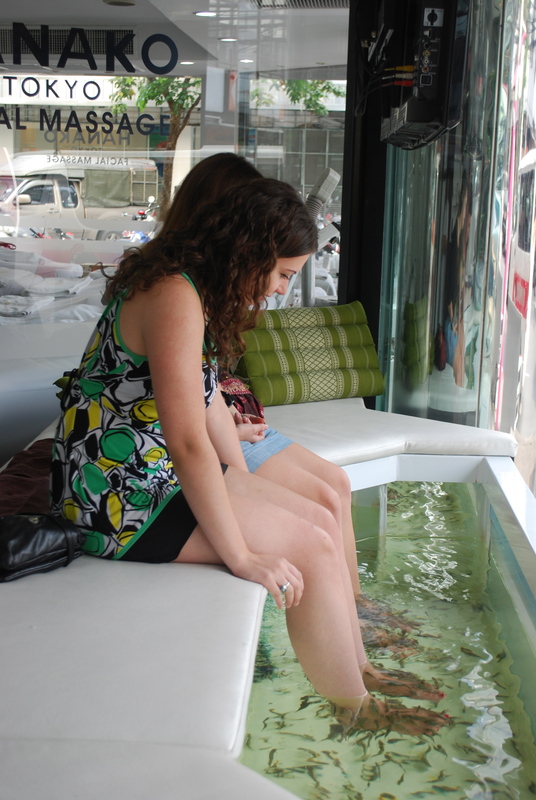 Fish Spa – Walk around the city and you’re bound to see a few of these. What appear to be fish tanks placed strategically on the floor of spa shops or street sidewalks are actually there for fish spa services. You can dip your feet, arms, etc. into the tank and the little guys start nibbling. These Grecian fish don’t actually eat dead skin but bite it and spit it out. Don’t worry through; it doesn’t hurt but rather feels like a vibrating sensation. The benefit? It leaves your skin feeling smooth and refreshed. Chinatown – Known as one of the biggest Chinatown’s in the world, this is a great spot to stop at night to sample some awesome street food (both Chinese and Thai) at some dangerously low prices. The Grand Palace – This complex was established in 1782 and consists of the royal residence and throne halls, numerous government offices, and the renowned Temple of the Emerald Buddha. This is definitely a must see in Bangkok. Thai massage – It’s most comparable to a visit to the chiropractor’s office. Your masseuse makes it her mission to get out every knot and kink in your body through means of twisting, cracking, stretching, and massaging. Withstand the not so gentle nature of the massage and you’ll feel like a new person when it’s done. Don’t worry; this will only set you back about $6. Siam Niramit Show – In a fashion that would make Disney proud, this show guides the audience through the history of Thailand and stages of karma. Complete with: elephants walking through the aisles, performers flying through the air, and a flowing river on stage, Siam Niramit captivates its viewers and educates them on the Land of Smiles. Nokia VIP Movie Theatre – We definitely felt like very important people in this movie theatre. There are only about 15 seats in the theatre, and you receive your own reclining couch, full size pillow, and duvet. Essentially, it’s like watching a movie from the comfort of your house but with the gigantic movie theatre screen. It’s the best of both worlds. Jatujak Weekend Market – Better known as the JJ market, this is the largest market in Thailand covering 35 acres and containing over 5,000 stalls filled with household items, souvenirs, clothing, shoes, plants, spices, handicrafts, jewelry, food, animals, lawn ornaments, and furniture. You can probably find anything you might want if you wander around long enough. Wat Pho – Also known as the temple of the reclining Buddha, this is definitely a sight to see. Step into the temple and gaze upon the massive statue of an enlightened Buddha, and be sure to snap some pictures of the golden wonder. Crocodile Show – Experience this nerve wrecking show as crocodile trainers place their hands and heads inside the mouth of a crocodile and interact with the audience. Don’t try this at home. Vimanmek Mansion – This is the world’s largest golden teakwood mansion and the former royal palace of Bangkok. Filled with crocodile skin chairs, ivory sculptures, and ornate imports from diplomats around the globe, this mansion and its elaborate architecture is a sight to behold. Take a tour to learn about the history of the mansion and its residents and check out the 31 rooms on display. Thai Village Cultural Show – Located in the Rose Garden, this show highlights the important aspects of the country’s rich culture through an entertaining performance. Includes: a traditional Thai wedding ceremony, Thai boxing match, sword fighting, and the famous fingernail dance reenacted by the talented performers. Prepare to be charmed and awed by the intriguing traditions of Thailand. Tuk-tuk ride –If you’re not familiar, a tuk-tuk is a three-wheeled motorized vehicle used as a taxi in Thailand. After hailing one down and agreeing on a price, you’ll hop on the back while the driver zips and zooms through Bangkok traffic at speeds like you wouldn’t believe. No trip to Thailand is complete without at least one tuk-tuk experience. Three years ago, a friend of ours taught English to monks at Wat Chedi Luang, right in the center of Chiang Mai, Thailand and suggested we pay a visit during our stay. So of course we visited Wat Chedi Luang and spent the afternoon participating in their Monk Chat Program. The purpose of the program is to educate Western visitors on Buddhism and monk life while also allowing the monks to practice their conversational English and interact with people from different cultures and religions. A monk named Minx greeted us and invited us to sit across a table from him to talk. We began by talking about the daily life of a monk and the Buddhist system. For example, young men can enter the Buddhist system as a monk as young as age seven and can stay for a varying amount of time (as short as a few weeks or as long as a lifetime). During our two hours chatting with Minx and a few other monks we pretty much covered all the bases: politics, religion, sports, music, food, language, weather, education, and travel. We enjoyed when the monks explained to us that English tongue twisters are difficult for them, such as “I scream, you scream, we all scream for ice cream!” However, I think the funniest moment was when Minx suddenly reached under his orange robe and pulled a cell phone out of a little zippered pocket. True fact: Many monks text message and have Facebooks. It’s interesting how monks can live such similar and different lives than us at the same time. 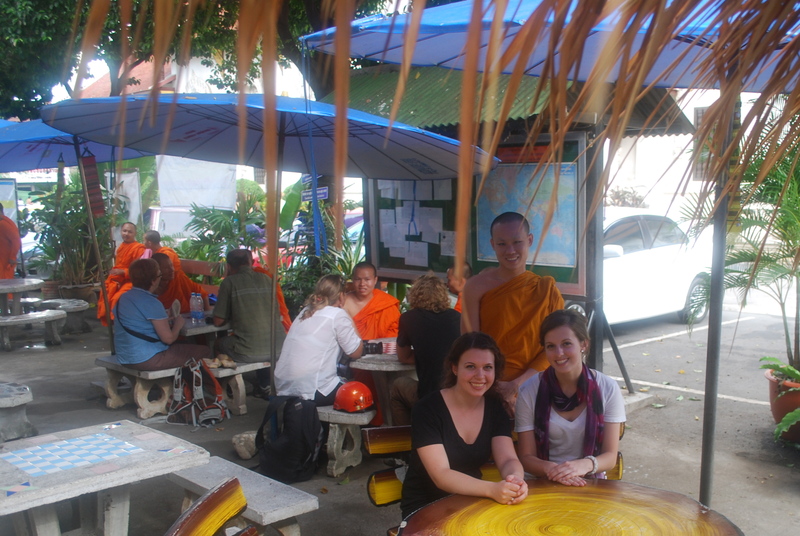 About a week later, we had another unexpected encounter with a monk in Laos. While chatting with the guy named Dao working the night shift at the reception desk of our hotel, we discovered that he recently just left the monk system. He went to monk school from age 16 until less than a month ago and was experiencing a complete change of lifestyle. Dao explained to me the types of things monks are not allowed to do such as touch women, have girlfriends, play sports, wear normal clothes, dance, drink alcohol, or smoke. We were surprised that monks were not allowed to dance and asked Dao if he wanted to dance. He said that he really wanted to but that he never has before and he didn’t know how. So of course, we cranked up the music, hit the open space in the hotel lobby, and showed our new friend/ex-monk how to dance. It was one of the most heartwarming moments to teach a 23-year-old man to dance for the very first time in his life and see the huge smile across his face. However, the best part was that it put an even bigger smile on our faces. Well, Coley and I thought that we left all the extreme adventure activities back in New Zealand, but I guess we were wrong. 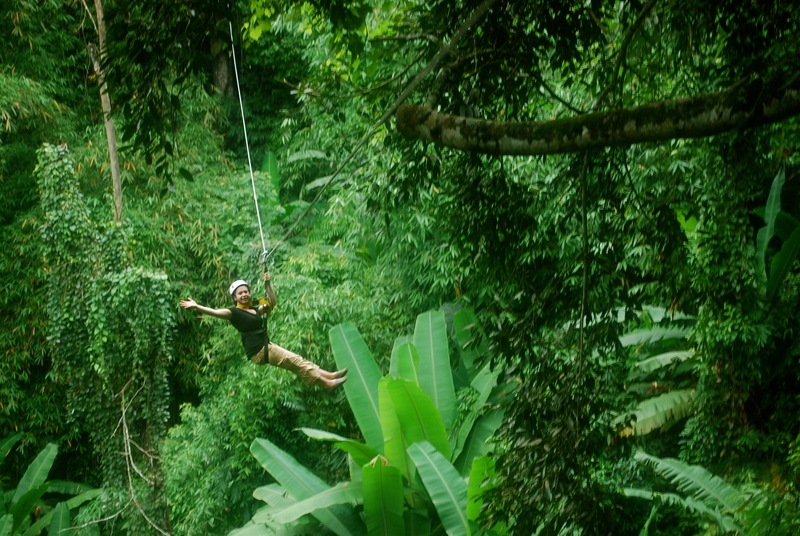 During our time in Chiang Mai we unexpectedly decided to partake in a once in a lifetime opportunity to zip line through the 1500-year-old Mae Kompong jungle in northern Thailand. The Flight of the Gibbon experience is advertised as the best attraction in Thailand and “perfect for extreme fun lovers.” We were sold. We were booked on the sunrise experience, so we arrived at the Flight of the Gibbon office bright and early after an hour drive up the mountain on the windiest roads imaginable. They got us set up with a harness and helmet and we met our two Thai guides for the day named “Big Daddy” and Joe. We were lucky that our group was comprised of us and seven of our new friends that we met in Thailand earlier in the week. 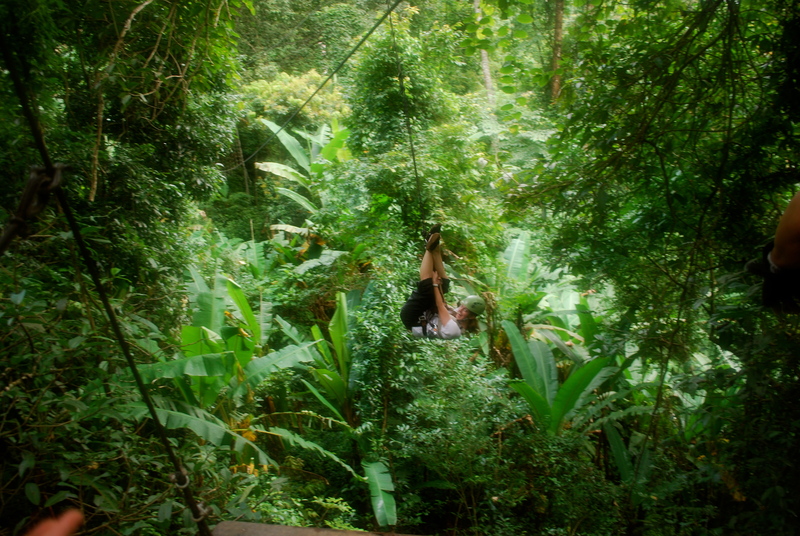 Finally, we were driven high into the canopy where we walked to the first platform and were ready to go. Since this was a last minute decision we honestly didn’t know much about it and thought that we would get to go on maybe three different zip lines if we were lucky. Well, we were pleasantly surprised to discover that we’d be spending 3 hours soaring through the rainforest on three kilometers and 39 different stations of zip lines. We started out with a few short lines and worked our way up to the longer and obviously more awesome ones. As we made our way through the course, first Joe would zip to the next platform and Big Daddy would stay with us to hook us up and send us down the line one by one. The funniest part of zip lining was the landings on the next platform, most of which were not too graceful. Joe (who was nearly 5 foot tall) would try to catch us as we came flying towards him, sometimes at ridiculous speeds and sometimes backwards or sideways. On some of the lines we would fly into nets and then climb them up to the platform like we were in some type of obstacle course. Another nice surprise was that there were many different types of lines and ways we could fly across. There was a two person (“honeymoon”), a few abseil (“mission impossible”), a head first (“superman”), a zigzag swing, and even an upside-down line where we hung by our feet. The zip lining experience is called Flight of the Gibbons because there is a chance that during your time in the jungle you can see gibbons, which are apes native to Southeast Asia. The only time we’ve seen gibbons before was on Planet Earth so we were really excited about this possibility. We were told that our chances of seeing one might be slim since it is currently the rainy season in Thailand. However, we were extremely fortunate that we spotted a father, mother, and baby gibbon hanging out in a tree above us. 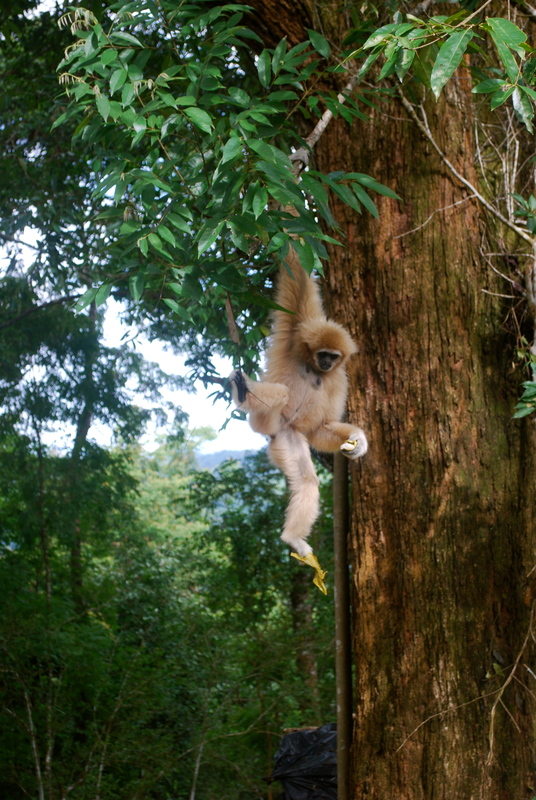 The gibbons are known for their loud hooting calls, which are oddly enough quite similar to the “woo” sound we make as we’re on the zip line. Coley and I both agree that this was hands down our favorite activity we’ve done on our trip thus far because it was a perfect combination of thrilling and fun without being too scary or life threatening. It was also an incredible experience alone to spend three hours in a jungle and see a family of gibbons in the tree above us. Lesson of the day: sometimes the best adventures are the ones you didn’t plan.